To the greater glory of God an association of laity, deacons, priests, bishops and religious was inaugurated and consecrated to the Immaculate Heart of Mary, in the Shrine of Our Lady of Fatima on Tuesday, 15th May 2001. The aim of the Association is to promote the worship of almighty God, Father, Son and Holy Spirit, through encouraging devotion to the Most Holy Virgin especially under her title of Our Lady of Fatima and to work for the re-union of all Christians under the patronage of Mary, mother of the Church. Members keep a rule of life which includes the daily recitation of at least one decade of the Rosary and the regular use of the Sacrament of Reconciliation. Priest members of the Association should, wherever possible, offer Mass for the Association on or about the 13th of the month. 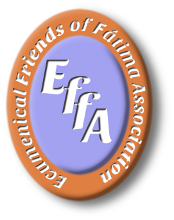 By prayer and its best endeavours the Association supports the cause for the canonisation of the Seers of Fatima. “I will return to Fatima. If for no other reason than that it is there and that I recognise I need it. To keep me humble in my faith. To challenge me in my life. And to strenghten me in the knowing that I am part of a praying community both now and after my death. Our Lady Mary entrusted her message to three little shepherds in a remote village in rural Portugal. It is in that choosing as much as the message itself that we experience both challenge and comfort.